Re-inventing the Ikea rast dresser was VERY easy and relatively inexpensive. It is constructed of solid wood making it a great surface to paint, wallpaper, stain, etc. 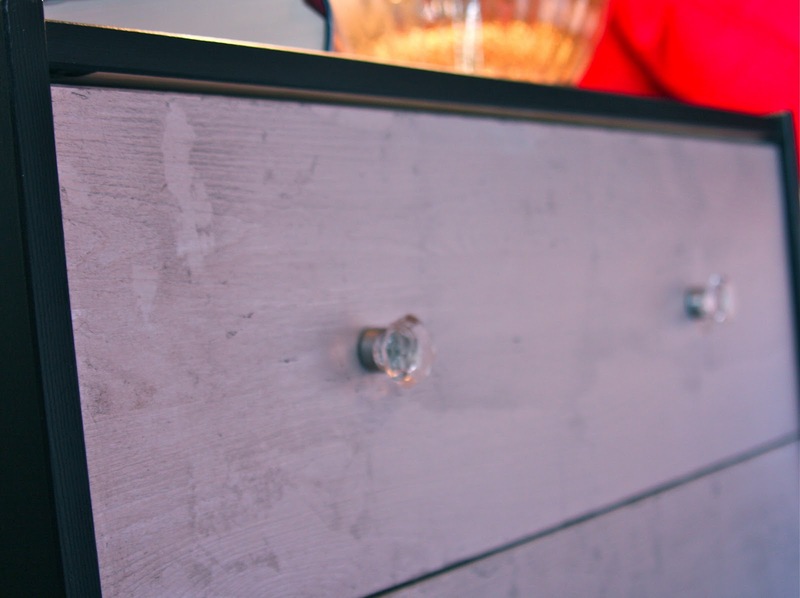 Because I am frugal and love to DIY, I decided to silver leaf the drawer fronts of the dresser and change the knobs to give the Ikea Rast dresser the glamour treatment. This project was easy, as silver leaf is very easy to work with. Silver leaf is very delicate and light but forgiving, the first few tries will be tricky but you'll get the hang of it quite quickly. It is easy to patch up and cover gaps with bits of silver leaf. I find it amazing how it all blends together. What I found was that silver leafing wood with a grain was a bit more challenging to get a seamless finish than on a smooth surface such as my lamp. Lightly sand the dresser with a sanding block and clean off the dust. Paint the outside of the dresser and drawer fronts. It took only 2 coats of paint using the Aura paint. I didn't prime because the paint I used has a "built-in" primer. If you use other paint you will want to prime as the surface is raw wood. When paint is dry, you can start the gilding process on the drawer fronts. You will want to do this in an area that is easy to clean up as you will get silver dust everywhere. Paint on a good layer of gilding size, following the directions on the bottle. I let the size dry until it was tacky to the touch and turned clear. But here are photos of a lamp I gilded, the process is the same. Now adhere the silver leaf using a brush to pick up the leaf, slightly overlapping each piece. Smooth each piece with a brush, brushing away the loose bits. Silver leaf is very forgiving. If you missed a spot you can take a little piece of leaf and just smooth it in with your fingers. Once dry, add knobs of your choice. I used these crystal knobs from Home Depot. At $6 each, they ended up costing more than the dresser itself but so worth it as they add that extra touch of bling! Ooh! I like seeing your in-the-process pics...looks the way my dressers look right now :) I am sorry that my process is taking so long, still no sign of my backordered ring pulls! I love this....you did an amazing job! Okay, this is amazing. 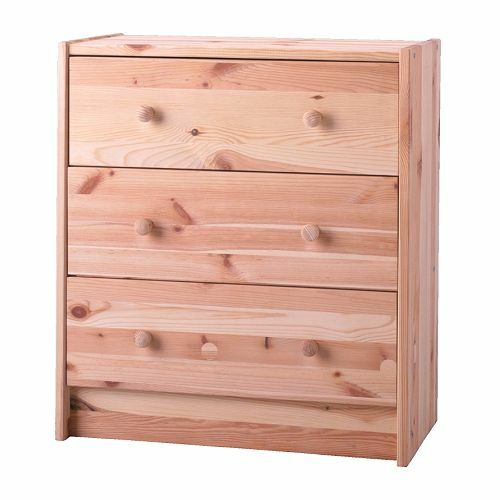 I've overlooked that little dresser at IKEA so many times. We've been looking for inexpensive nightstands for our bedroom, and this is the perfect solution. I found you over at Centsational Girl and couldnt resist having a look at your delightful drawer makeover, it looks like a real designer piece especially with those crystal knobs nice touch. I like this. Maybe I should give it a try. Thanks for sharing! Barbara, this is fantastic. What a great combination of treatments. It looks great by the red headboard. Love it! It just looks so Marilyn Monroe Movie Star Vintage. Love it! Great tutorial Barbabra. And, I agree, the knobs really do make the dresser! Thanks for posting my giveaway on your sidebar! Wow what a genius job!! It looks fantastic. Want to share it on my Facebook page!! Great job Barbara! You make it sound simple - will have to try it! Wow, I give it up for you that is so incredible, I'm so impressed!! I better stick this on my facebook page next! What a great idea! It looks so pretty. I can't wait to try this one! Such a fantastic transformation; this is definitely a top-rate Ikea hack! You rocked it!! :-) Oh... and I definitely need to try silver or gold leaf with something! Fun!! Great job transforming the dresser :-) I just used silver leaf for the first time last week making over a tray. I definitely need more practice! This is brilliant! It looks like a really fabulous piece of furniture now - very impressive. Greetings from Melbourne, Australia. Whoa nellie...that is pretty swanky!!! Love it. Thanks for sharing. I have seen that dresser "hacked" in so many ways! Your is the best! Brilliant! I added some gold leaf detail to a black iron chandelier...that dressed it up. You are talented! Very nice! Thanks for the comment on my own RAST hack. It is such an awesome starting piece for projects. I would love for you to use my dresser in your round up! Thank you! Lovely! What a wonderful idea, it gives the piece great dimension! Thanks for stopping by my blog to check out my Ikea hack and I would love to be included in your round up! Thanks:-)and I am looking forward to following your blog. Fantastic job - I love your dresser! I linked it to my dressers post too, well done! Whew! Hope you have the photos of some of the gilding process. I love the dresser already, eh. Your Rast turned out great!! I am also into silver pieces of furniture! !